SMS Marketing allows retailers, brands, small businesses and organisations to market by text to a wider audience on their mobile phones. With Direct SMS send mobile coupons and special offers, beat off-peak downtime, upsell higher margin products, inform customers of hours, locations and new products. Ubiquity SMS Marketing service allows small businesses, national brands and marketing agencies to get more customers to respond using our SMS platform. Easily segment your mobile marketing database. Create demographic, regional and interest based segmentation lists and track response rates from different marketing campaigns. SMS marketing can be challenging when you have to deal with delivering high message volumes, always-on SMS request handlers, management of opt-ins and opt-outs and compliance issues. Ubiquity platform handles all that for you, so you can focus on growing your business. SMS marketing can increase match attendance, provide special member offers, or simply be used for creating positive fan engagement experiences. SMS Marketing can be used by Insurance providers to improve customer satisfaction and NPS, improve cash flow and reduce operational overheads. SMS Marketing helps retain customers for your physical or online store. 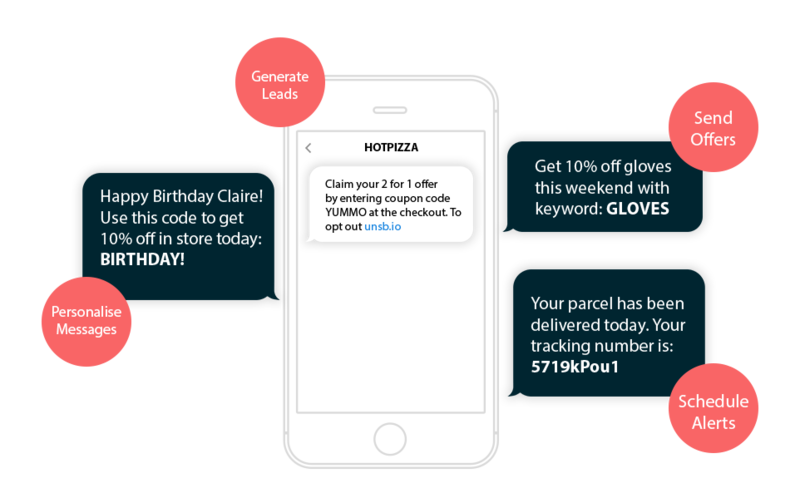 Branded messages and dynamic text fields let you send more personalised text messages that increase open rates and conversions. SMS text messaging can be a great way to get important information to parents of children, such as notifying parents of absentees, last minute changes to excursions or use SMS Text messaging for surveys and feedback. SMS Marketing helps remove the barriers to mobile giving. Enable seamless donation reminders, announce new campaigns, or simply use it to stay front of mind with existing customers. SMS Marketing, or text message marketing, is a simple way to get your client’s message out to their prospective or existing customers – instantly! Offer exclusive deals and coupons, beat off-peak downtime, upsell high margin goods and services or announce new products. Broadcast service information, or even allow patrons to ‘give’ through ‘Smart Messages’. Smart messages can remove the friction from the act of giving and addresses issues of location, or clunky paper based donation processes. Increase conversion rates by sending SMS marketing campaigns around the world from a branded Sender ID, wherever it is supported. Branded Sender ID’s increase recipient confidence and are therefore more likely to take action. Build complex applications on our sms marketing platform. Access more data and statistics, automate marketing processes, signups, and more.